However we think of ourselves—expats, gringos, visitors, tourists—when we want to straighten out our visas, taxes, or license plates, we’ve all brushed up against the Mexican and Oaxacan governments, their laws and their bewildering array of agencies. Some of us hire lawyers, some of us flounder through on our own, but when we come out on the other side we still wonder whether we got it right—are those license plates for real or are they fraudulentos? Unless you’ve gone off to get your INAPAM senior discount card, though, you probably haven’t encountered the government that actually makes the most difference in your daily life—the municipio (roughly equivalent to counties in the U.S. and eastern provinces in Canada). Article 115 of the Mexican Constitution, written in 1917 during the Revolution, establishes the “free Municipality as the basis of . . . territorial division and political and administrative organization,” with no governing bodies between the municipios and the state government. The arrangement of government in Oaxaca is arguably the most complex in Mexico. Currently, the state is divided into 570 municipios, close to a quarter of the 2,442 municipios in the entire country. Each muncipio has its own cabecera municipal, or head city, as the seat of local government. Huatulco is in the municipio headed by Santa María Huatulco, Puerto Ángel is in the municipio of San Pedro Pochutla, Puerto Escondido is in San Pedro Mixtepec, and Oaxaca de Juárez is the head city of its own municipio. Why does Oaxaca have more than twice as many municipios as any other state? Location, location, location! Mexico’s middle states are mountainous, and Oaxaca is probably the most rugged of all—three mountain ranges fold together in the complejo Oaxaqueño: the Sierra Madre de Oaxaca comes east from Pico de Orizaba, the Sierra Madre del Sur runs along the coast, and the Sierra Atravesada comes westward out of Chiapas. Mountainous = isolation, which established de facto municipios long before the Spanish ever arrived. The Spanish found this local level of government convenient and continued it, often sticking a “sanctified” name before the indigenous name, as in Santa María Huatulco, San Felipe Lachillo, Santiago Xanica, etc. Not soon enough for the Zapatistas next door in Chiapas, though. 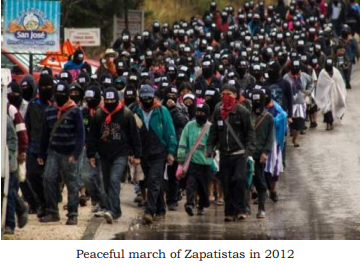 In 1994, the Ejército Zapatista de Liberación Nacional (EZLN), or the Zapatista Army of National Liberation, launched itself with opposition to the signing of NAFTA (North American Free Trade Agreement) and demands for better conditions for indigenous peoples and preservation of traditional communal land systems (ejidos), not to mention an end to government abuse of human rights and general corruption. While the Zapatista movement and the government response is a long story in itself, certain EZLN actions had far-reaching indirect consequences that affected local government in Mexico—especially in Oaxaca. The EZLN instituted a parallel government that favored indigenous people, allowed campesinos to expropriate land, and took over the government of 38 Chiapan towns. In the 1990s, as the Zapatista movement continued its demands for indigenous empowerment and autonomy, and as the long-time dominant PRI party (Partido Revolucionario Institucional) started losing power, Oaxaca started making changes in municipal election codes. Even though Oaxaca remained a PRI stronghold until the mid 2000s, municipal governments were given the freedom to run local political processes without officially including national political parties. Municipios could choose new, place-specific electoral systems, and nearly three quarters of them—418 of the 570—did so. The jury is still out on why the state of Oaxaca promoted municipal election reform. Did it truly stem from the desire to support indigenous organization and autonomy? Or was it an effort to preserve PRI power in the face of new parties on the way up? Whatever the forces that allowed municipios to choose government with or without political parties, the change gave rise to the form of local government called usos y costumbres, with amendments to the Oaxacan constitution in the mid to late 1990s, presaging a 2001 amendment to the Mexican constitution. This state-level support, combined with geographic and historical factors, makes Oaxaca the “home” of local autonomous government in Latin America. It appears in a few other Mexican states—Sonora allows it for its Yaqui reservation (zona indigena), about a third of Chiapas’ municipios (38 of 118) have instituted it, and Tlaxcala held its first elections via usos y costumbres in 2012; it also appears in Guatemala, Bolivia, and Colombia. And how does governing by usos y costumbres work? It starts, of course, with the municipio framework created in the 1917 Constitution, and whether a given municipio has chosen to govern itself by usos y costumbres; of the municipios mentioned above, San Pedro Pochutla, San Pedro Mixtepec, and Oaxaca de Juárez are governed by usos y costumbres, while Santa María Huatulco uses the party system. The government is divided into departments, which are thought of as the positions occupied by community members—a person’s obligation to serve the community at some point in time is called a cargo, and the cargos can vary by municipio depending on what’s needed. The free labor a person gives to execute his cargo is called tequio (only rarely are women selected to fulfill a cargo). On average, by the time he is sixty, a man will have been obligated to serve 15 years in performing cargos. For example, if you lived in the town of Zimatán in the Municipio of Santiago Astata, you would be governed by 15 cargos. Administrative positions include the Municipal President, Trustee (the sindico, whose responsibilities differ by municipio), Treasurer, and Secretary. There are three directors (regidores) of municipal functions—education, building projects (obras), and agriculture (hacienda). There is a municipal judge, a municipal comandante, the municipal police, and topiles, younger people who handle community security, rather like auxiliary police or a community watch committee. There are four committees: Heads of households, drinking water, school facilities, and the church. Many municipios host two assemblies to establish regulations, an assembly of Comuneros and an assembly of ciudadanos, with the comuneros managing community resources and the citizens handling civic issues. Santiago Astata has a single Asamblea General Comunitaria. Usos y costumbres—How well does it work? Santiago Astata is on record as requiring women to complete cargos: “The women in this community have the obligation to provide services and can discharge community or municipal cargos.” Who knows how well this works in practice, but it’s progress in equality: many municipios do not allow women to participate fully, which is tantamount to saying they are not full citizens of the community. Several academic studies have found that women participate in local government in the 152 municipios that govern by political party at twice the rate they participate in the 418 municipios with usos y costumbres government, and that nearly 20% of these municipios do not allow women to vote, let alone serve in a cargo position. Allowing women in Santiago Astata to discharge “municipal” as well as community cargos indicates that even municipios run according to usos y costumbres must account for and connect with state and national political structures, and party affiliation inevitably underlies many candidates for local office. Because the outcome of usos y costumbres is seen in local elections, political maneuvering between elections sometimes has the effect of switching a municipio back and forth from one form of government to the other. Moreover, it is possible, if a municipio does not “behave” the way the formal government might like, it can find itself with parallel government structures—one with officials set up by the state and one with office holders put in place by the community. This is the case with Santiago Xanica, a municipio northeast of Santa María Huatulco that has been active in indigenous resistance movements since the late 1990s. Xanica has its own indigenous rights organization, CODEDI (Comité por la defensa de los derechos indigenas), whose members are extremely active in the state-level indigenous rights organization APPO (Asamblea Popular de los Pueblos de Oaxaca). These activities apparently alerted the PRI to the need to establish stronger controls, which produced a tense situation with open armed hostilities and allegedly trumped-up jail sentences. Although some of the power conflicts have lessened in intensity, there is new conflict about the state’s diversion of Xanica’s natural resources, including and especially the waters of the Copalita River, to serve Huatulco’s tourism needs. Xanica seems in line for parallel governments for some time to come. Santiago Astata also establishes penalties for not completing one’s cargo, which highlights a major problem with the system. Many Mexicans leave cash-strapped rural villages to work outside the country, usually in the U.S.; they send part of their income back to their hometowns in the form of remittances, usually to their families although sometimes to village projects.